River alligator (we think) figurehead on the Dunderburg. The Dunderburg was a three masted schooner built by J.M. Jones of Detroit in 1867. She was lost in a collision with the steamer Empire State late in the evening of August 13, 1868. It is reported that a female passenger on board the steamer was thrown overboard during the collision and drowned, the only loss of life. 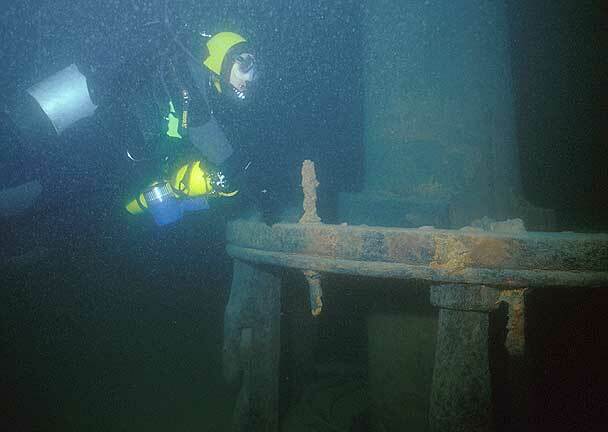 The Dunderburg now rests upright in about 150 feet of water, approximately four miles off Harbor Beach, Michigan, in Lake Huron. 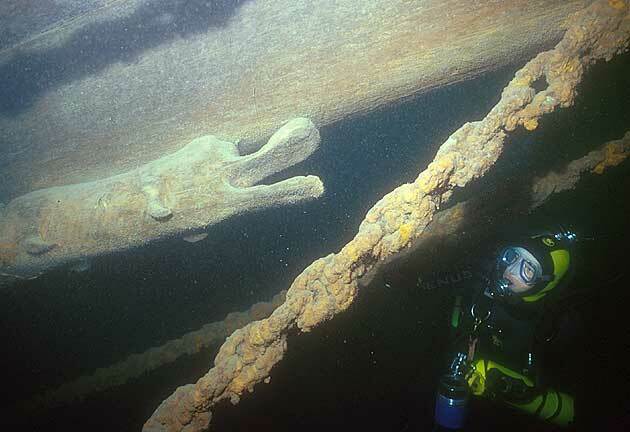 A river alligator figurehead has made this dive quite famous among Great Lakes wreck divers who save money in order to visit the location for themselves, and it is a favorite technical dive destination. The reason for the alligator figurehead has remained a mystery since the wreck was located by Kent Bellrichard in 1971. Legend has it that the alligator’s eye is still dabbed with red paint, but that may be gone after constant sediment cleaning by divers. Two of the three masts still rise for a short distance above the deck. A schooner of this era, built to actually sail instead of designed with a cut down rig for towing behind a steamer, would have had a rig that towered to maybe 170 feet above the deck. The masts would have risen above the surface after the sinking. Today they rise to the point where they were snapped off by early salvors. Note: Our first dive on the Windiate in 2003 was also a test of an underwater video camera. We had heard that this shipwreck would be well worth a visit, but the experience surpassed all expectations. Standing masts are rare, and so are intact cabins: deck structures tend to to be torn loose by rising air as a vessel sinks. The Windiate still has all the hatch covers in place. It was hard to imagine how slowly and gradually the sinking must have taken place for the ship to land on the bottom in 200 feet of water with everything in place on deck. 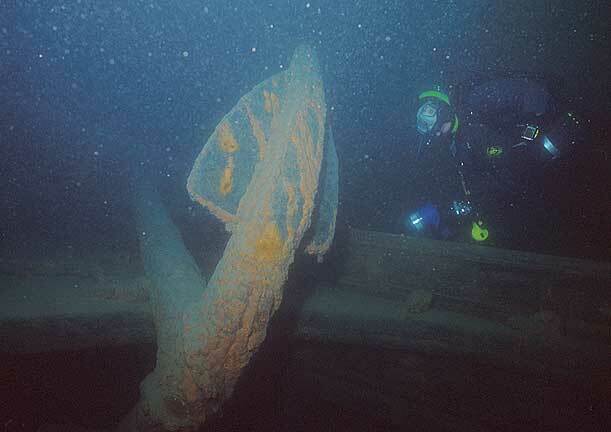 A close look at the deck in the video reveals lengths of chain stretched out back from the chain locker in the bow. We speculate that with the bowsprit broken off, and the sailors unable to set a foresail to keep the bow up, they attempted to shift the weight of the chains away from the bow. It is also suspected that ice could have formed and sank the ship with added weight, a very real hazard when sailing the Great Lakes in the month of December. 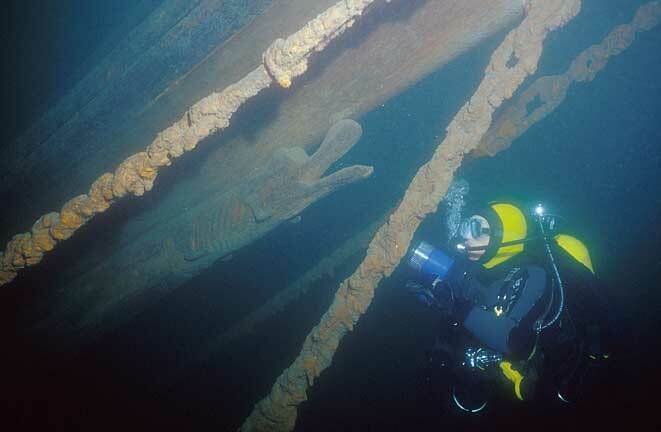 A comparison of the video stills (fuzzy, with a scratch on the lens) and the still photos taken two years later reveals the rapid growth of invasive zebra mussels on every surface of this shipwreck. The mussels have greatly improved the water clarity, but our video offers a last good look at the degree of underwater preservation that was practically unique to the Great Lakes. Detail of the figurehead from below, showing the alligator’s feet..
A lone belaying pin in the fife rail at the base of the mast. Mast is snapped off just above the top of this photo. One of the two anchors at the bow, flukes shipped inside the rail.